Want to cover a lot of ground, but not interested in doing the driving? Here’s a three-day itinerary that keeps it carless and carefree. Each day includes transportation, and if you get in a pinch or want to mix things up, taxi and ride-hailing services in Anchorage give you even greater flexibility. Spend a little time on foot. Downtown Anchorage is the city’s most walkable neighborhood. The compact grid of streets packs a lot of shops and attractions into 10 square blocks. And when you’re ready to venture further, attractions like the Alaska Native Heritage Center, Alaska Zoo, Anchorage Museum and Ulu Factory each offer free shuttles from the visitor center at Fourth Avenue and F Street. 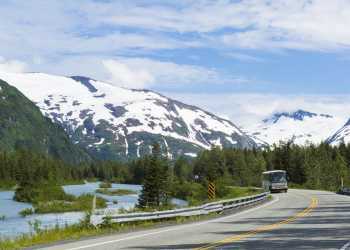 Photography tours, trips along Turnagain Arm, beer tasting tours and a whole host of other guided sightseeing and day trips include transportation. Follow a passion, or let the driver show you the best of the surrounding area. There are shuttles to the most popular hiking spot, Flattop, and Segway tours that zip through some great parts of Anchorage too. The options are almost limitless. Ask your guide for a dinner recommendation as you return to the city. There are thousands of options, and a little local advice can help you pick one of the best spots. Board the Alaska Railroad for an incredible journey. The train moved people and supplies across Alaska long before the first roads linked the state. It remains a great way to see amazing landscapes and get from place to place, all in the comfort of a spacious railcar. Take the Coastal Classic to Seward for a day of glacier and wildlife cruising, or board the Glacier Discovery train for a trip to the tiny coastal town of Whittier or the exclusive Spencer whistle stop and its towering glacier. The Anchorage depot is the jumping off spot for rail travel, but it also sits at the beginning of two of the best paved trails in Anchorage. The Ship Creek Trail and the Coastal Trail each start just a few blocks away. Take a stroll for water views, mountain vistas and even a look at urban salmon fishing. Anchorage is home to a tremendous concentration of pilots and small aircraft, and many parts of Alaska are easiest to access by air. Lake Hood Seaplane Base and Merrill Field are the departure point for sightseeing flights to Denali, bear viewing in Lake Clark or Katmai national parks, Prince William Sound, and many secluded spots in the nearby Chugach Mountains. Check to see if hotel shuttle service is available, several include transfers from the front door of your hotel. Spend the day above Alaska the way eagles do. Even at altitude, Alaska’s vast landscape with mighty rivers, stark peaks and verdant forests stretches out in all directions. When it’s time to head home, hotels with airport shuttles take the guesswork out of getting to the airport. Just make arrangements with the front desk, and let the hotel staff whisk you from door to door!